Eve came to speak to a group of our women professionals yesterday about networking and rainmaking and her presentation was terrific! She is a dynamic speaker, incorporating real life examples, humor and audience participation. She touched on topics that resonated with our women professionals at all levels – junior to senior. In addition, she addressed areas that had practical applications in our everyday professional lives. We would welcome Eve back to our firm anytime! EVE BIRNBAUM ASSOCIATES (EBA) provides customized group programs on career success and business development that address the unique challenges of professional women in the workplace. 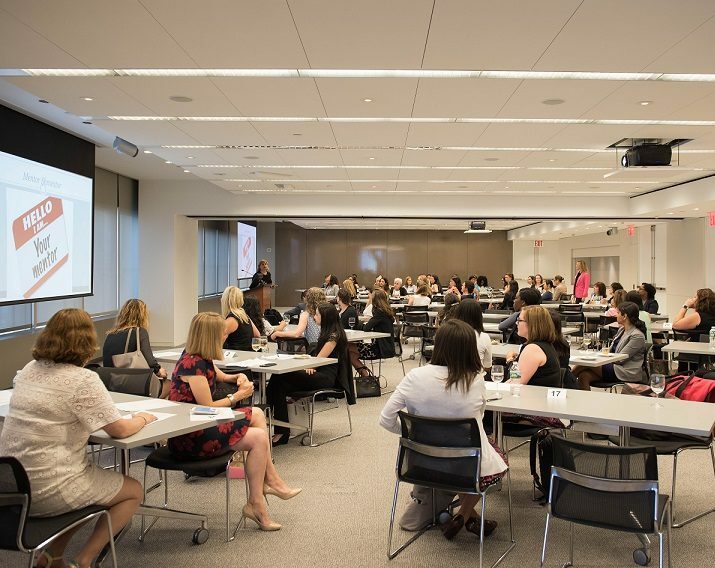 EBA has presented to major law and financial services firms, including Mayer Brown, Baker Hostetler and FTI Consulting, as well as to professional women organizations including, the Association of Corporate Counsel-NYC Women, NYSBA Women, and Women In Law Empowerment Forum (WILEF). Eve draws on her unique personal experience as a woman who made partner through the ranks at a global law firm while raising a family, and then successfully making career transitions to law firm director, and then to independent business owner. She has a passion for advising women and helping them identify their priorities and make career choices that align with their goals – both professional and personal. She and her team work collaboratively with your firm to create customized programs. This business development training was created for professional women in finance and law. Eve demystifies “rainmaking” and addresses the unique challenges that your senior women face in cultivating business relationships. This 1.5 hour interactive course teaches the ABC’s of networking, and provides concrete practical steps to turn a contact into a client. The participants will learn how to create their personal message and how to deliver it effectively. In this 1-hour luncheon workshop, EBA teaches the participants how to create their personal narrative and how, and to whom to deliver it – in order to advance professionally. The culmination of the program is a 30-minute speed networking session where the participants will try out their newly – acquired skills. It’s a terrific bonding program for the women at your firm or organization. This program draws from the recent research that has shed new light on how gender differences impact workplace perceptions and behaviors. The program applies this knowledge to create practical tools for advancement and success for women professionals. Are you ready to give up on “mentoring programs?” EBA has developed a workshop that teaches your participants a new approach to cultivating mentorship and sponsorship relationships. Your participants learn how to identify their “personal board of directors” and how to develop their board for mutual benefit. EBA has run this workshop at legal industry groups to excellent reviews. This workshop will facilitate your transition from your current career to your new second chapter –whether you are just beginning to think about making a change, or have already identified or even embarked on your Second Act. This program will give you the tools to move forward. It is presented with Dr. Marian Getzler-Kramer, practicing psychologist, and addresses the practical and psychological challenges of moving forward to career happiness!